Once upon a time, there was a Tunkhannock Rotarian named Lou Jasikoff, who hosts an internet talk radio show (Jasikoff & Friends) on Twigs Café Radio and has founded and published several Independent Gazette newspapers. In late November, Lou interviewed Dean Debra Pellegrino of the University of Scranton’s Panuska College of Professional Studies (PCPS) and 2 of her colleagues regarding illiteracy issues in the region and nationwide. During the discussion, Dean Pellegrino briefly described the “Blessing of the Books” Program of the PCPS, where children’s books are collected and distributed to organizations and children’s programs to promote literacy. Lou immediately challenged Dean Pellegrino to a friendly competition between the University and the Tunkhannock community to see who could collect the most new or gently used children’s books. 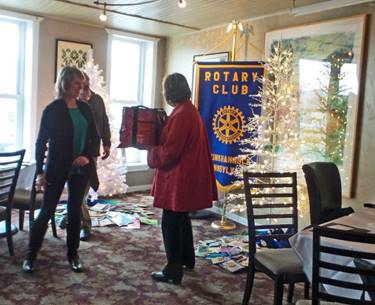 After the radio interview, Lou brought this challenge to the next Tunkhannock Rotary Club meeting and before Lou could get back to his seat, the Club had voted to buy $100 worth of children’s books from the Tunkhannock Public Library (TPL) book store. So on Dec 3, the Club presented Lou with 200 books for this program. It was a win-win-win for all involved as the Club expanded its literacy initiatives, the TPL benefited from the books purchased from their bookstore and the Blessing of the Books challenge got off to a good start. 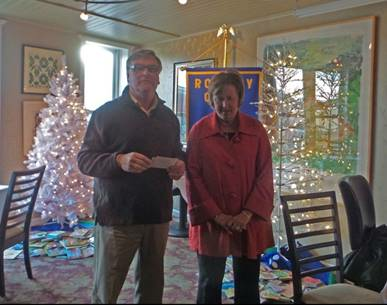 But the Rotary Club’s involvement did not stop there, Terry Furman, Chair of the Club’s Literacy Committee and a teacher/trainer for H.A.N.D.S. of Wyoming County, called upon Tunkhannock Area School District (TASD) Superintendent Frank Galicki to promote this program in the 4 elementary schools in the District. Superintendent Galicki recorded a message that was sent out to all parents of the elementary school students through the District’s automated call system. They also decided to hold a home room competition in each of the schools to see which homeroom could collect the most books. The winning home room in each school would be treated to a pizza party courtesy of the Tunkhannock Rotary Club and TASD. Lou then spoke at a meeting of the Tunkhannock High School Interact Club and the Interactors immediately embraced this project as well. They too held a homeroom competition for the most books collected. 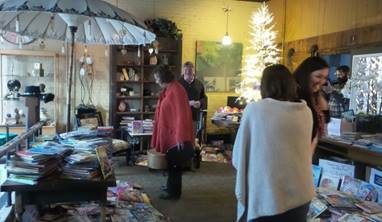 Additionally, purple “Blessing of the Books” bins were placed in area businesses and locations in Tunkhannock so that the community could also become involved. Lou promoted this event on his talk show and in print. As the elementary schools were closing for the holidays, Rotarians Ron Furman, Terry Furman, Wayne Krause and Lou Jasikoff made the rounds of the 4 elementary schools gathering up all the books. They then had to carry the books up 4 flights of stairs to the 3rd floor of Twig’s Restaurant where the books were being stored. On Jan 13, Lori and Jerry Bogedin, owners of Twig’s Restaurant, hosted a reception on the second floor for representatives of the PCPS and organizations and businesses that contributed to or supported the book collection. 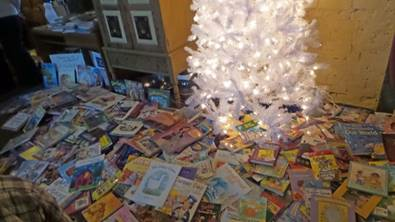 Over 500 books were stacked throughout the room and under the Christmas trees. Lou introduced Dean Pellegrino, who thanked everyone for participating in this program. Rotarian Terry Furman presented the Dean with a book bag that was received in the collection that read “Every child deserves a good book”. Lou then invited the Dean and the assemblage to join him on the 3rd floor of Twigs. As the Dean climbed the 2 flights of stairs, she noted that there were books stacked on every step. But she was not prepared for the wonderland of books that greeted her on the 3rd floor. As people climbed the stairs behind the Dean, they could hear her exclaim “Oh my God!” several times, and “I just can’t believe it.” Books were piled all over the floor, under and in the Christmas trees and on every available surface in the room. Top: Dean Pellegrino (left) overwhelmed by the number of books collected. Bottom: More of the books under one of the Christmas trees. After the reception, Lou Jasikoff interviewed several of the participants involved in the book collection on his internet radio talk show “Jasikoff & Friends” (http://twigscaferadio.com). He began with the Tunkhannock High School Interact Club represented by Faculty Advisor Tommasina Fiorillo, President Gabrielle Frigano and Vice President Dana Kuffa. The Interactors described their club activities, (e.g. their upcoming sale of Pulsera bracelets made in Nicaragua to benefit students in that country) and their collaborative projects with the Rotary Club (including Candy Cane Day and Roadside Clean-ups). 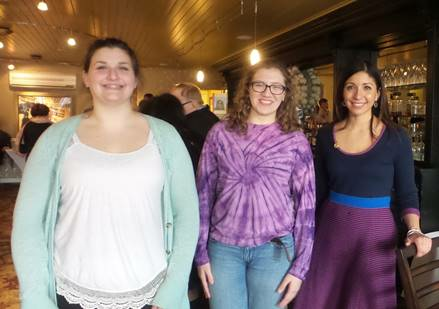 Seniors Gabrielle and Dana also discussed their post-graduation plans, including the fact that Dana will be a 2016-2017 Tunkhannock Rotary sponsored outbound exchange student to Chile. They reported that the High School gathered 400 books for this project. Superintendent Frank Galicki and Rotarian Terry Furman were the next interviewed. Superintendent Galicki described how Terry had approached him with this program and had even written a jingle that he used in his automated recorded call to the parents of the elementary school students at Mehoopany, Evans Falls, Mill City and Roslund. Terry announced that the Mehoopany Elementary School collected the most books (almost 2,000). 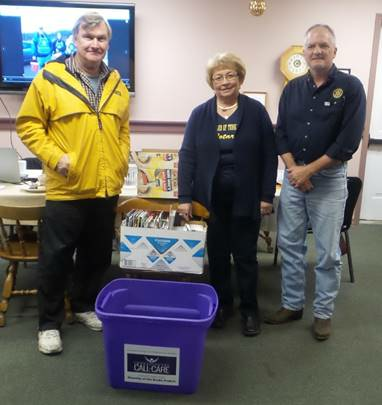 They were then joined by Tunkhannock Rotary President Ron Furman who described the activities of the Club, the challenge of carrying 3 truckloads of books up 4 flights of stairs and the Club’s upcoming events, including April’s Drug Take Back outreach efforts. The interview ended with Lou talking with Dean Debra Pellegrino and her colleagues Sandy Pesavento (faculty specialist at the University of Scranton) and Jenna Stoddard-Kelly (school psychologist for the Blue Ridge School District). Dean Pellegrino described the founding of the Blessing of the Books program that is now in its 9th year (nearly 20,000 books distributed in the first 8 years) and the next steps for the books collected. Once the PCPS students return from winter break, they will sort the books and personalize each book plate with a hand-written note. The books will then be distributed to children’s organizations and programs locally and nationally to promote literacy. Some of the books will come back to the Tunkhannock area, including to H.A.N.D.S. of Wyoming County. Oh, in case you are wondering who won the friendly book collection competition between University of Scranton and the Tunkhannock Area. The University collected 3,500 books. Tunkhannock Area collected 10,000 books (6,500 from the Elementary schools, 400 from the High School, over 200 from the Rotary Club and the rest from the community who responded very generously to Lou’s call for action on his radio shows and in print.) But as Dean Pellegrino remarked: “The real winners are the children who will receive these books.” The Dean expressed her hope that this can become an annual collaboration.